Court documents reveal how the late Apple CEO won over News Corp. on eBook pricing. The US government's price-fixing lawsuit against Apple goes to trial next month in New York. Ahead of its court date, the US released emails that purport to show Apple was the "ringleader" in a scheme to set artificially high ebook prices with some of the largest American publishers, which have already settled the case. The emails have mostly been viewed in the context of the lawsuit, but they also provide an extraordinary view of high-stakes negotiation between the leaders of two powerful firms, Apple and News Corp. 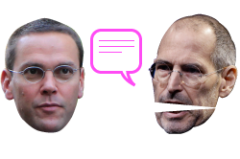 They start far apart, but over the course of five days, Apple's then-CEO Steve Jobs successfully pulls the son of News Corp. CEO Rupert Murdoch over to his side. Jobs was a famously hard-nosed negotiator who won these kinds of battles all the time. Before book publishers, there was the movie industry. And before that, music record labels. But most of those negotiations were hidden from view. What follows are the emails released last week along with some context; spelling and grammar have been preserved from the originals. It was a Friday morning, January 22, 2010. Apple was preparing to release its newest product, a long-rumored tablet computer, the following week. Part of the iPad's appeal was supposed to be the vast array of media that could be consumed on it, but one of the largest American publishers, HarperCollins, was holding out from signing a deal to sell its ebooks in Apple's iTunes store. Those were the stakes as Eddy Cue, Apple's head of iTunes and the App Store, visited executives of HarperCollins and its parent company, News Corp. The substance of that meeting was conveyed in an email sent to Cue later that day by Brian Murray, the CEO of HarperCollins. It detailed the publisher's opening bid in the negotiation, with five days remaining until the iPad's unveiling. Thanks for coming in again this morning. We've talked over the proposal and I want to make sure that you have a summary of the deal that HarperCollins would be willing to do in your timeframe. 1. Pricing: We need flexibility to price on a title by title basis outside the prescribed tiers in the contract. We will use our best efforts to meet the tiers we discussed. 2. MFN ["most favored nation" status]: In the event that HarperCollins and Apple disagree on a consumer price for a title, HarperCollins needs the ability to make that title available through other agents who support the higher price. 3. Commissions: We need a lower commission on new releases for the economics to work for us and our authors. We believe a 30% commission will lead to more authors asking for ebooks to be delayed a result that will not work for Apple or HarperCollins. 4. The new release window: We need to have flexibility on the agency window. We believe this window should be 6 months rather than 12 months in the event that one or more large retailers do not move to an agency model. Leslie will be sending Kevin a contract that reflects these points in the event you wish to move forward on these terms. Those terms were never going to fly with Apple, which had successfully signed deals with HarperCollins's rivals, like Penguin (a division of Pearson) and Simon & Schuster (part of Viacom). Those deals would allow Apple to set prices for new ebooks at $12.99--three dollars higher than the typical rate at that time on Amazon--and take a 30% cut of each sale. But HarperCollins wanted the freedom to set its own prices and worried that $12.99 per ebook would hurt its sales on the new iPad as well as the Kindle. It also didn't want to give up 30%. To back up its position, James Murdoch, a high-ranking News Corp. executive, forwarded Murray's email to Apple's then-CEO Steve Jobs, and included the following note. It was still Friday. Thanks for your call earlier today, and for the time last week. 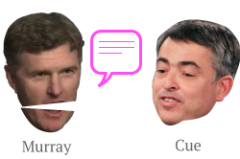 I spoke to Brian Murray and Jon Miller [then the head of digital media at News Corp.]--and Brian is sending a note to Eddy today. I thin I have a handle on this now. In short--we we would like to be able to get something done with Apple--but there are legitimate concerns. The economics are simple enough. [Amazon] Kindle pays us a wholesale price of $13 and sells it for 9.99. An author gets $4.20 on the sale of a hardcover and $3.30 on the sale of the e-book on the Kindle. Basically--the entire hypothetical benefit of a book without raw materials and distribution cost accrues to Apple, not to the publisher or to the creator of the work. The other big issue is one of holdbacks. If we can't agree on the fair price for a book, your team's proposal restricts us from making that book available elsewhere, even at a higher price. This is just a bridge too far for us. Also, we are worried about setting prices to high--lots of ebooks are $9.99. A new release window with a lower commission (say 10[%]) for the first six months would enable us to proce much more kenly for Apple customers. We'd like to da that. More on this below in Brian's note to Eddy. We outline a deal we can do. Feel free to call or write anytime over the weekend to discuss if you like. I am in the UK (so eight hours ahead of CA). My home number is [redacted]. I check the email regularly. Steve, make no mistake that across the board (TV, Studios, Books, and Newspapers) we would much rather be working with apple than not. But we, and our partners who produce, write, edit, and otherwise make all this with us, have views on fair pricing, and care a lot about our future flexibility. I hope we can figure out a way, if not now and in time for this launch of yours, then maybe in the future. Jobs wasn't willing to compromise. He sent this reply to Murdoch the same day, arguing that Amazon's pricing wasn't sustainable and would train people to think that ebooks were cheap. 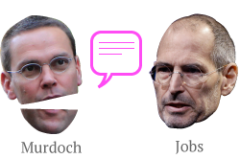 Jobs also reminded Murdoch of Apple's vast reach--"over 120 million customers with credit cards on file." You need us more than we need you, he seemed to be saying. 1. The current business model of companies like Amazon distributing ebooks below cost or without making a reasonable profit isn't sustainable for long. As ebooks become a larger business, distributors will need to make at least a small profit, and you will want this too so that they invest in the future of the business with infrastructure, marketing, etc. 2. All the major publishers tell us that Amazon's $9.99 price for new releases is eroding the value perception of their products in customer's minds, and they do not want this practice to continue for new releases. 3. Apple is proposing to give the cost benefits of a book without raw materials, distribution, remaindering, cost of capital, bad debt, etc., to the customer, not Apple. This is why a new release would be priced at $12.99, say, instead of $16.99 or even higher. Apple doesn't want to make more than the slim profit margin it makes distributing music, movies, etc. 4. $9 per new release should represent a gross margin neutral business model for the publishers. We are not asking them to make any less money. As for the artists, giving them the same amount of royalty as they make today, leaving the publisher with the same profits, is as easy as sending them all a letter telling them that you are paying them a higher percentage for ebooks. They won't be sad. 5. Analysts estimate that Amazon has sold more than one million Kindles in 18+ months (Amazon has never said). We will sell more of our new devices than all of the Kindles ever sold during the first few weeks they are on sale. If you stick with just Amazon, Sony, etc., you will likely be sitting on the sidelines of the mainstream ebook revolution. 6. Customers will demand an end-to-end solution, meaning an online bookstore that carries the books, handles the transactions with their credit cards, and delivers the books seamlessly to their device. So far, there are only two companies who have demonstrated online stores with significant transaction volume--Apple and Amazon. Apple's iTunes Store and App Store have over 120 million customers with credit cards on file and have downloaded over 12 billion products. This is the type of online assets that will be required to scale the ebook business into something that matters to the publishers. So, yes, getting around $9 per new release is less than the $12.50 or so that Amazon is currently paying. But the current situation is not sustainable and not a strong foundation upon which to build an ebook business. Apple is the only other company currently capable of making a serious impact, and we have 4 of the 6 big publishers signed up already. Once we open things up for the second tier of publishers, we will have plenty of books to offer. We'd love to have HC among them. Murdoch's reply came the following afternoon, Saturday, January 23. Jobs had made clear that Apple wouldn't budge. Murdoch was about to indicate that HarperCollins would. He proposed two possible compromises, then noted that News Corp. and Apple were negotiating on a number of fronts. "Is it worth considering in the round, over the next few months or weeks, whether or not some of these loose ends can be tidied up?" Murdoch wrote. The iPad announcement was four days away. I think the crux of this is our flexibility to offer product elsewhere at price-points you don't like. If we could offer to you that a certain percentage of releases (>50%) would be available within your pricing structure (< or = 14.99), does that give you enough comfort? I think we are worried more about the absolute holdback of product elsewhere, and our ceding of pricing to Apple, than we are about the actual haggle over what the price will be. I haven't shared this with HC directly--so this is only hypothetical. But if you were willing to accept that a supplier can exploit other avenues (at prices not disadvantageous to you), with a guarantee of substantial volume through Apple--maybe I could work with HC to get to some common ground. A different question: we have four areas of discussion (related to our product) between our teams right now: Books, US Video, Int'l Video, and newspapers. All at different stages of maturity, these discussions are all centered, for us, around the desire to make our product widely available, and to make yours and our products more attractive for our customers. It seems though that we in each one we largely encounter a "take it or leave it" set of terms, and predictably we've so far failed to really strike the kind of partnerships that could move things forward. Is it worth considering in the round, over the next few months or weeks, whether or not some of these loose ends can be tidied up? It's clear that Apple is already becoming an attractive platform for so many of our customers--all over the world. As a creative company at our core, NWS [News Corp.] should be more engaged with Apple, and I think Apple could be more engaged with NWS, globally, than either of us are today. With Murdoch indicating that HarperCollins was willing to compromise, Jobs pressed harder. "As I see it, HC has the following choices," he wrote in a reply to Murdoch the following morning, Sunday, January 24. Jobs outlined three stark choices. Accept our terms, he was saying, or good luck with Amazon. "Maybe I'm missing something, but I don't see any other alternatives," Jobs wrote, almost daring Murdoch to spurn Apple. "Do you?" On Tuesday, a day before the iPad announcement, HarperCollins agreed to Apple's terms. The publisher's ebooks were included in the iBookstore unveiled on January 27 along with new tablet, more than 100 million of which have now been sold.